Last year, after receiving the diagnosis of a rare autoimmune skin disorder, I committed to doing everything in my power to get to the bottom of it and ultimately to the end of it. So after working with a great naturopath and getting several tests done, I've been experimenting with my diet. I decided to transition to a more paleo diet and reduced my sugar intake to almost null. Being someone with a strong sweet tooth, it wasn't easy. My pitta nature craves sweet taste to take the sharp edge off, to ground my energy and to cool my fiery tendencies. I have a propensity to get laser-focused on whatever I'm working on to the point where it becomes all-consuming (great for productivity, not so great for work-life balance). Sweet taste has a dulling, sedative affect (once you get over the sugar high) and is associated with the emotions of love, connection, compassion, joy, happiness, and bliss. It's no surprise we love our sweets! However, the evils of sugar are hard to ignore. Sugar leads to inflammation, premature aging, cancer, diabetes, liver disease, hormone imbalances, high cholesterol, skin problems, and more. Even if we are choosing "natural" sweeteners like honey, maple syrup or raw cane sugar, they still carry many of the adverse effects (despite having some nutritional benefits as well). So over the past few months I've stopped eating most fruits (except low sugar fruits like berries), grains, legumes, and sweeteners of all kinds. I know this is extreme and I don't suggest everyone needs to do this but if you're dealing with auto-immune disorders, gut issues, health problems, excess weight, low energy, moodiness, or skin problems, it would be well worth the effort to do a sugar detox. Having gone through one myself, I've discovered a few tips that make it a bit easier. Make no mistake - it's still hard, but strapped with these, you'll be less likely to find yourself with your hand in the cookie jar! Remember the emotions associated with sweet taste - love, connection, compassion, joy, happiness, and bliss? When we crave sweets we want to feel grounded, taken care of and comforted. Self-massage, or abhyanga in Ayurveda, is the body practice of rubbing oneself with oil. It's a way of generating self love. It increases oxytocin, the "cuddle hormone' which allows us to feel those same qualities we're looking for when we search for something sweet to eat. This only works if you like licorice. 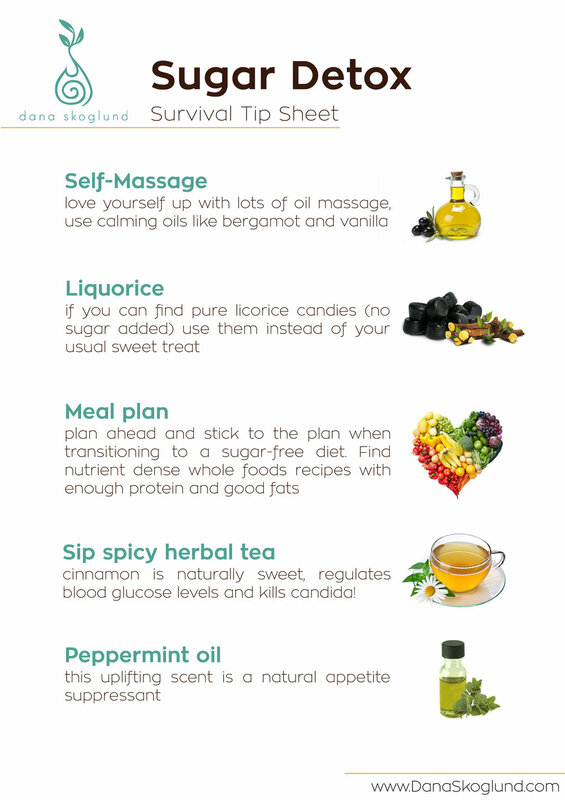 Not only does licorice pack many nutritional benefits (anti-inflammatory, demulcent (soothing), antioxidant, immunostimulating), but they are naturally sweet and will satisfy the sugar cravings. Find them at your local Italian grocer and make sure they are made with 100% licorice and no sugar or other additives. Valorosa has them in Kelowna. I talk about meal planning ad nauseum but it truly is the way I can follow a clean and healthy diet. Make sure each meal has lots of healthy fats (avocado, nuts, seeds, coconut and olive oil), a good source of protein and plenty of nutrient dense greens and veggies. If you're used to dessert after eating, make a naturally sweet spicy tea instead. Cinnamon stabilizes blood sugar and has been shown to reduce sugar cravings. I like Bengal Spice by Celestial Seasonings and Market Spice by Chai Baba. But any caffeine-free chai blend should do the trick. This uplifting and invigorating scent is a natural appetite suppressant. It's also a great stress and tension reliever, helps with mental focus and even soothes upset tummies. How to use it: drink it in tea, diffuse the essential oil, or place a few drops in your palms, rub together and inhale deeply.